What do you use as birth ball covers? Do you use a Rebozo to carry it or a sheet? Does it ROLL down the street as you’re trying to put it in your car? Or do you bring it deflated in its box and pump it up once you arrive to your client’s home or to the hospital? YourDoulaBag.com made this hilarious but oh so true video of how challenging it can be to transport our beloved birth balls! Why use a birth ball cover? 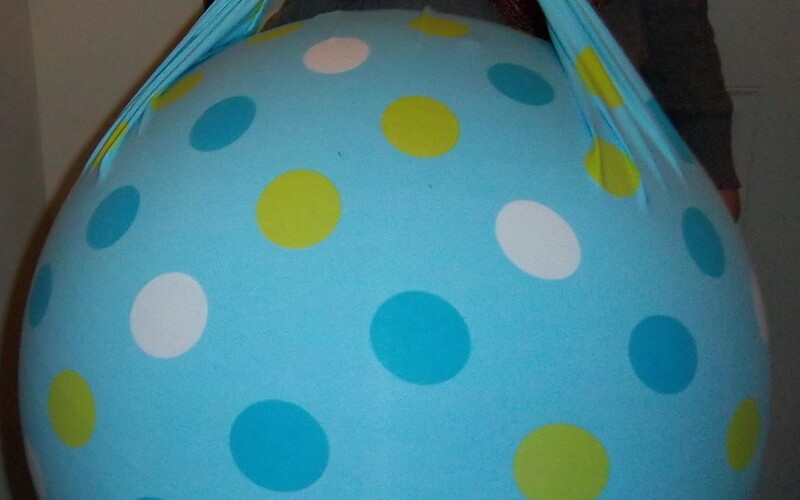 A cover easily slips over your birth ball or peanut ball and tightens with a drawstring. This makes travelling super easy and keeps the ball clean and ready to use for the client in labor! Why not just wait to inflate it when you arrive? Often by the time you arrive to your client who is in labor, she needs your encouragement as a doula, nurse or midwife. If your birth ball or peanut ball isn’t already inflated, you will be using precious time inflating the ball, or instructing her loved ones to do it, when you could be offering your compassionate support to your client. It’s much easier if the ball is ready to go when you arrive; if only it wasn’t such a circus show trying to carry it, along with your doula bag and other necessities! The covers/carriers have a contrasting color or print covering the grip on the handle. The “bottom” of the cover/carrier has a drawstring to make it easy to get the cover on and off quickly. The stretchiness of this material nicely hugs the ball whether it is fully inflated or not. Clean up is a breeze because exercise ball covers are machine washable!! The birth ball covers/carriers have a large handle, which will easily fit over the handle of a rolling birth bag. You can also place the handle diagonally over your chest and carry your birth ball or peanut ball like a messenger bag to keep your hands free for your other bags. If you’re a parent, you’ll love the fact that the birth ball covers allow the ball to be hung on a hook on a wall at home to keep the ball out of the reach of children when it’s not in use! What size birth balls and peanut balls do the birth ball covers fit? 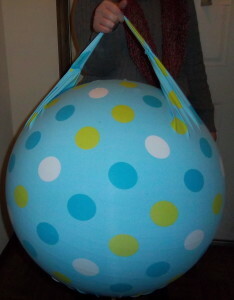 All covers are made to fit a 65 cm birth ball or the 40 cm peanut ball easily. They will stretch to fit the 50 cm peanut ball. Because some fabrics stretch more than others, some covers will fit a smaller or larger ball. Get your Birth Ball Covers and Peanut Ball Covers from Premier Birth Tools by visiting our store today!